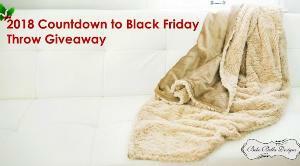 Prize: "ENTER TO WIN A BEBE BELLA DESIGNS THROW! RETAIL VALUE $150.00 HEAD ON OVER TO OUR BLOG FOR YOUR CHANCE TO WIN! STOP BACK DAILY FOR MULTIPLE ENTRIES. *ONE ENTRY PER HOUSEHOLD *WINNER MUST RESIDE IN CONTIGUOUS U.S.
What you must do to enter: You must be entered by submitting an entry using the online form provided on this site.